As soon as the ceremony ended, Jupiter sheparded the Knights out of the grand room and off to a smaller antechamber. They were met by a palace maid, who curtseyed. Jennifer nodded, “We just finished them this morning! Set up barracks-style, just as you requested, Secretary of Protection!” the young lady replied and opened a door for the boys to exit through. “Be nice, guys! I’ll see you later – just get settled in,” Sailor Jupiter gave a little wave in farewell before returning to the receiving hall and taking her place behind the Queen. ‘They’ll be fine,’ she thought with confidence. The room that the boys were assigned was large, decorated in darker tones with a ceiling that mapped out constellations that were currently in the sky, slightly rotating out of sight to the west and coming into view on the eastern ceiling in time with the Earth’s rotation. Every planet visible was marked with its astronomical symbol, and a small porthole-like window was set to show real-time footage of Jupiter, the screen large enough to show each Galilean moon in detail. Ganymede claimed the bed that was closet to the window in the bedroom. He jumped onto the bed and his face hit his pillow. Both the bed and the pillow felt nice and soft. He sat up and looked at the other knights. They were quiet as they explored the room. Today's events were probably racing through their thoughts and they were just probably trying to soak it all in. He then looked down at his feet and thought about how he felt about today's events. He felt excited about the possibility of going off to protect a different planet. It made him feel useful again. However he did feel sightly scared about moving to a different planet. Sure he was a risk taker, but moving a different world with different cultures was intimidating. Also he would be going to the planet by himself and it made he feel sad. Yeah he can make friends easily, but he wouldn't be with his follow knights. It made feel sad that they would be separate. They were like brothers to him and besides Jupiter they were his only family. Ganymede then looked back up at the knights and wondered about their thoughts on their current situation. "So," he said breaking the silence. "How do you guys feel about our current situation?" Europa calmly looked around the room he'd be sharing with his brothers-in-arms. It was definitely large enough for everyone and it wasn't like they hadn't been forced to reside in the same space before. All four of the boys were close in their own way, being 'reborn' hadn't changed that. Europa found that fact comforting, especially since it was obvious that they weren't exactly welcomed by all. 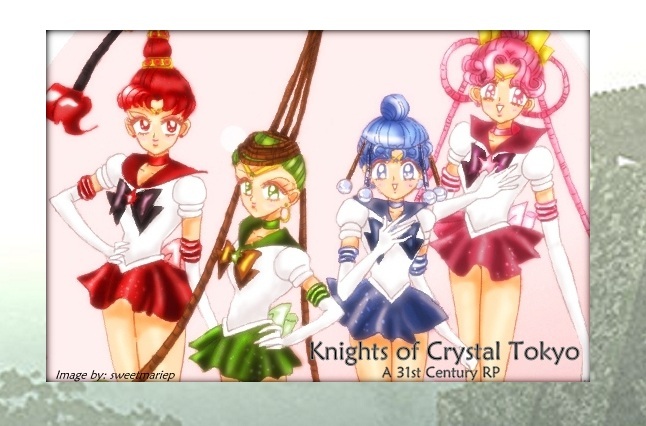 Sure, maybe the queen and her senshi and even her daughter liked the Knights but the Quartet? The jury was still undecided for them. Ganymede's rush to the bed next to the window startled Europa out of his musings and he couldn't help the small chuckle that escaped. He wondered if even the most care-free of the four was worried at all. There had been a lot of information dumped onto them since their awakening and he wasn't even sure how he felt about the whole going to other planets thing. However, if that was what Jupiter and Neo Queen Serenity wanted, who was Europa to say no? The knight sighed deeply, trying to expel all of his thoughts. He needed to stop worrying so much and focus on the present. Europa dragged his feet over to a bed, the one pressed against the eastern wall, and sat down on the edge. His pale blue eyes bore into the room's floor as the thoughts he wanted to avoid continued to run through his mind. He hoped that he'd be allowed to do something, anything, soon because Europa was tired of drilling himself with questions that he just couldn't answer. "Why do I have to room with you guys?" Io grimaced, a short sigh escaping his lips. He was joking however, and as soon as the sentence was finished he broke out in a grin. It wasn't like he had never roomed with the others before; and just because they had been reborn, it didn't mean that they were any less close than they had been before. Following suit, he made his way over to one of the two remaining beds, flopping down and lying back, his hands behind his head. Letting out a soft yawn, he glanced towards his fellow knight as the question was raised. "I'm glad to be back with Princess Jupiter," he answered. And truly, that was all he really cared about. He had failed his princess the first time around, this was their second chance, and he wasn't going to waste it. Europa looked up at Io's statement. What was he talking abo...oh, someone had asked something. He looked around at the others, quickly deducing that Ganymede had asked the question. He simply shrugged and began to pick at the sheets on his new bed. "We'll have to see. I get the feeling we're not completely welcome by everyone," Europa frowned at the thought of the Quartet's 'thrilled' expressions, "We're going to have to prove ourselves,"
Ganymede nodded to both of Io's and Europa's answers. It felt really nice to be back with Princess Jupiter. Ganymede just wish he could remember their times with her during the Silver Millennium. The only thing he could remember was that he helped teach Princess Jupiter self defense. He hoped that training with her with her again would help spark his memories. As for the Quartet yes Europa was right. They did not look thrilled to see them for whatever reason. They probably did have to prove themselves to them. That shouldn't be too hard because in his opinion him and his follows are skilled fighters. They were just a bit rusty and training should change that. Ganymede then felt the room was bit stuffy and walked over to the window. He opened it up and saw how beautiful it was outside. He then turned to Io and Europa and asked, "Do you guys want to go and explore Crystal Tokyo? It looks like an interesting city." I'm ignoring Callisto at the moment because we don't have someone roleplaying him yet. He's probably quiet anyway since he's the serious one. Europa's eyes narrowed with slight irritation. Ganymede was obviously trying to get around having to deal with the quartet. That approach wouldn't last for long and Europa would have preferred for them to sit down, talk about it some more, and then find a way to make some sort of a truce with Princess Serenity's guardians. "Fine," he said sharply. While his plan still sounded like a better idea than tourism, Europa wasn't going to argue. At least not yet, he'd save his cards for another day. After all, part of him was curious about Crystal Tokyo. Europa hasn't gotten the chance to read anything about the city so maybe first hand experience would be better. Icy everyone needs to chill out. "Excellent!" said Ganymede cheerfully and wrap his arm around Europa's shoulder. "You need to cheer up! This is going to be a grand adventure!" He then locked his shoulder up against his chest and rub his hair with his other hand. Ganymede stopped, when he heard a noise in the room. He turned saw Callisto closing a closet door. Ganymede then remembers that Callisto was in the room the whole time. He hadn't pay much attention to him since he was so quiet. He wondered if he would be up to exploring the town. If his memory severed him correct Callisto wasn't a fun guy since he was the leader. "So," he said. "Would you be up for exploring the town too?" he asked his fellow knight. He would probably say no, but Ganymede didn't want to seem rude. He then remember that Io hasn't given him his answer. "Io, are you in too?"